I’m going to keep this post short and sweet because we are just settling back to farm life after a whirlwind trip to NYC for my book events. It was an amazing trip and I’ll post a recap soon but for now I’m going to leave you with this tasty recipe! These miso and ginger chicken meatballs are a new household favorite. They’re flavorful, simple to prepare and perfect for a quick weeknight meal. 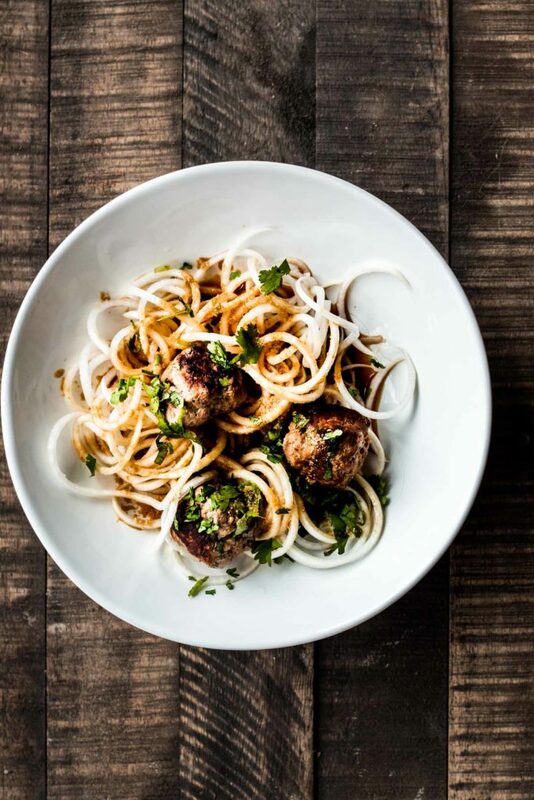 We tossed our meatballs with some turnip noodles and a simple soy-lime sauce. If you don’t have a spiralizer you can substitute with rice noodles which I think would be a lovely alternative. This meal is so delicious and on the table in 30 minutes. Perfect after a long day at the farm! Pour a glass of wine, clink glasses with your favorite dinner date and enjoy. Preheat the oven to 425F. Combine the chicken, egg, almond meal, scallions, soy sauce, miso, ginger and a pinch of salt in a large bowl. Using your hands form uniform 1 inch size balls (the dough will be fragile and rather sticky but just go with it! They'll work out in the end!) Transfer meatballs to a large rimmed baking sheet. Drizzle a large bowl with a little oil and roll each meatball in the oil. Place back on the rimmed baking sheet and bake until cooked through and lightly browned on all sides. About 15-20 minutes. Prepare the sauce by combining all the ingredients together and whisking until completely smooth. Taste test and adjust flavors if need be. Use a Spiralizer to make thin noodles out of your turnips. Heat a little olive oil in a a large skillet over medium heat and cook the noodles until just tender, about 3 minutes. Divide the noodles between bowls and top with a few meatballs. Drizzle with a little sauce and garnish with plenty of cilantro. These have my name written all over them, I’m always on the lookout for a great new meatball…and I can’t even stand it that you made turnip noodles! This looks wonderful! I love miso and ginger together! Yes!! Good catch. I just updated! Thank you. Michael saw this recipe come through on his email updates as we were sitting around trying to figure out which one of our “standard boring” meals we were going to make for dinner last night. Thanks to you Andrea, we had most of these ingredients already, so we were excited to try something new. We didn’t have chicken, but we had beef which would have been really great except I kind of burnt them 🙁 But that sauce!!! This recipe will most definitely be one of our standard (non-boring) lists. Thanks for always providing really yummy recipes that even novice chefs can make! Oh YUM! This sounds amazing! A ton of my favorite flavors all in one place! Look forward to whipping this up! amazing recipe! so creative, can’t wait to make it. thank you! Saw some lovely daikons (there aren’t turnips at the moment) at the market this morning, and these meatballs look like the perfect topping! Can’t wait to try it out. The meatballs and sauce were delicious! Thanks for the recipe! Is there any way to get the turnip noodles crispier? I liked them, but my son and husband were “eh” about them. It was my first time to use my spiralizer! These look so good! Any ideas for veggies to serve in the dish? Coming off a long weekend of eating I think I need some extra veg love but am blanking on ideas for other veg…zuchini? Sauteed spinach? Broccoli?